Get ready to discover amazing work lunch ideas that will change your entire lunch routine. Forget about boring sandwiches, salads that are not filling enough, going out during your lunch break only to grab something unhealthy because it was the quickest option. What do you like to eat for lunch? Are you the type of person who preps quick lunch recipes at home and packs them for lunch? Or do you prefer eating out during your lunch break? Or do you buy something for lunch on your way to work? I like to have healthy options from home for lunch so, for me, things are pretty simple – I use leftovers to quickly put something together or I meal prep. Yes, I’m totes obsessed with meal prep. I think everybody knows this by now. But, if you’re not like me and meal prep doesn’t sound too good to you, quick lunch recipes are the answer. Because it’s hard to stay away from unhealthy temptations when you don’t pack your lunch for work. But don’t worry, it won’t take you forever to do. Your work lunch can be ready in less than 15 minutes! Great news! 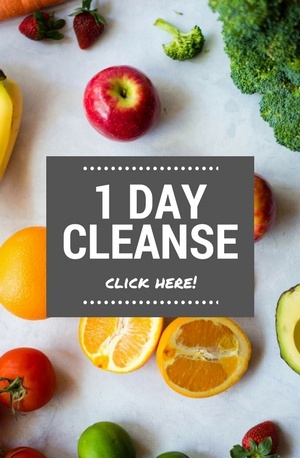 On the other hand, if you love meal prep, there are a few options for you here that take a little longer to prep and cook but then you have a week full of healthy lunches for work waiting for you in the fridge. That’s also awesome! It’s up to you. You decide which of the easy lunch ideas are the ones you want to try. I gathered them all in this post to make things easier for you. There are 50 recipes here so you definitely have options. Airtight containers for storing these easy lunches to take to work. You have different options for different recipes: meal prep containers or quart mason jar. For grab-and-go lunches, I’d opt for plastic containers since it’s easier and safer to use plastic instead of glass meal prep containers. Mixing bowls, food processor or blender, vegetable peeler, spiralizer for prepping the ingredients for the easy lunch recipes. Skillet, deep pot, baking sheet, saucepan, slow cooker, for cooking the ingredients for the easy lunch recipes. Opt for nutritious ingredients that will give you energy and will keep you full for hours. To not get bored with the same lunch every day, try different easy lunch recipes, don’t make the same thing every day. You have 50 options here – some are healthy lunches for work and others are better for cheat days. But all of them are totes delicious. 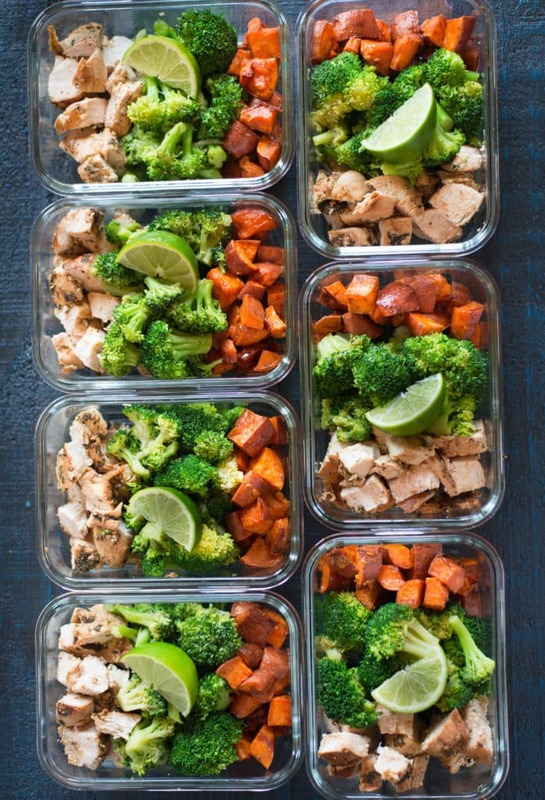 Prep ahead – meal prep will make you stick to the plan of prepping your lunch at home. So make a list of packed lunch ideas you love and decided on a day to prep your work lunches. If you don’t have time for something new, make a classic sandwich with healthy ingredients and quickly put together a side salad to be sure you have a nutrient-rich lunch ready. To make sandwiches healthy, opt for whole wheat bread, lean protein, skip the mayo and opt for a clean sauce like honey mustard or hummus, and add veggies. 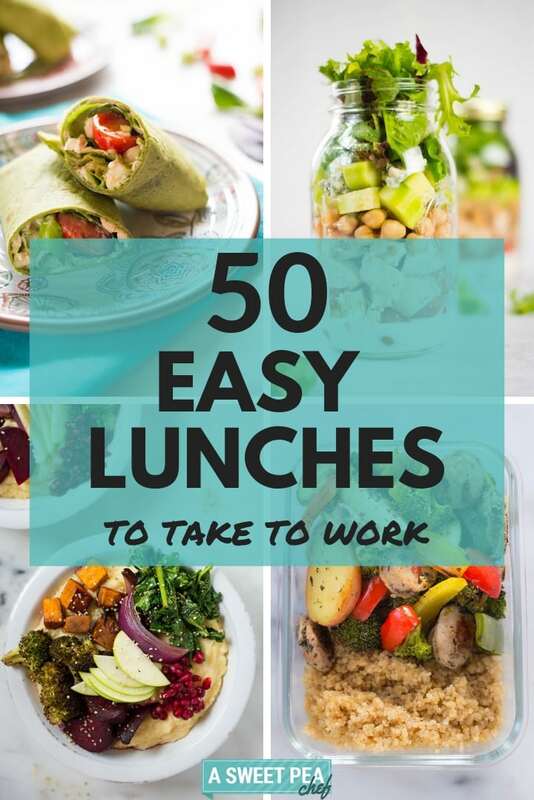 Before listing all the amazing easy lunches for work, let me say this – most of these easy lunch recipes are ready in 30 minutes or less. So you don’t have to worry – you won’t spend hours prepping your lunches to bring to work. And the rest of them are easy lunch recipes you can meal prep. Whether you opt for the quick lunch recipes or the meal prep recipes, one thing is for sure – your lunch break will no longer be a problem. 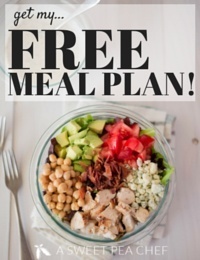 Stress-free lunches for everybody! 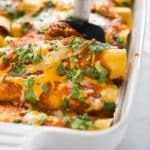 To help you choose, cooking time, prepping time, and other recipe details are highlighted for all the easy lunch recipes included here. Let’s start with classic work lunch ideas – salads. 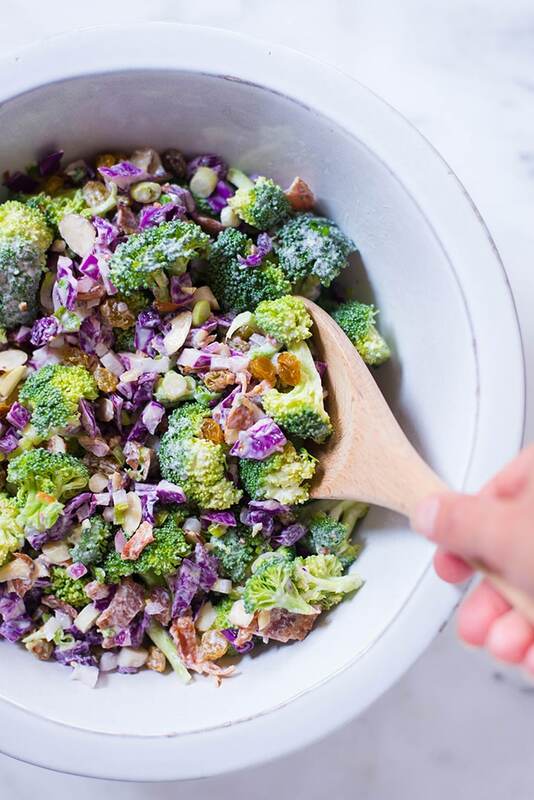 First salad on our list – Healthy Broccoli Salad with Greek Yogurt Dressing. Made with greek yogurt not mayo, this salad is healthy, nutritious, easy to make and perfect to pack for lunch. Salad no. 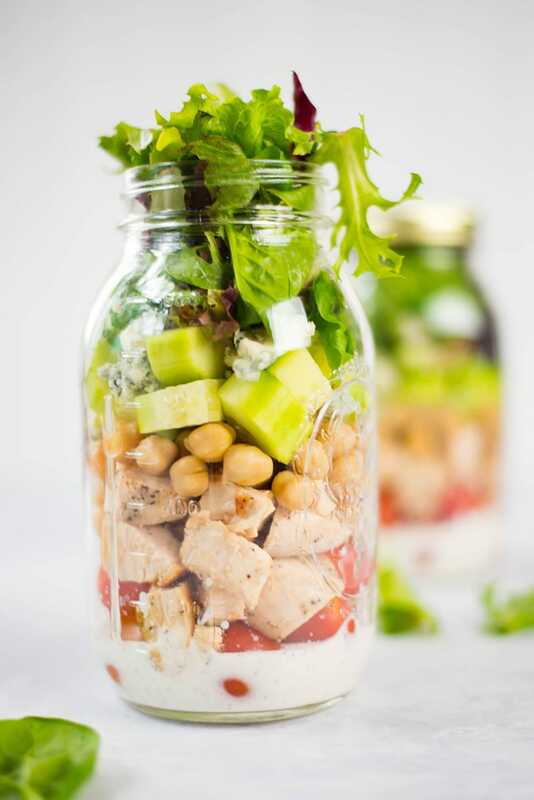 2 on our list of healthy lunches to bring to work – Chicken Cobb Mason Jar Salad. 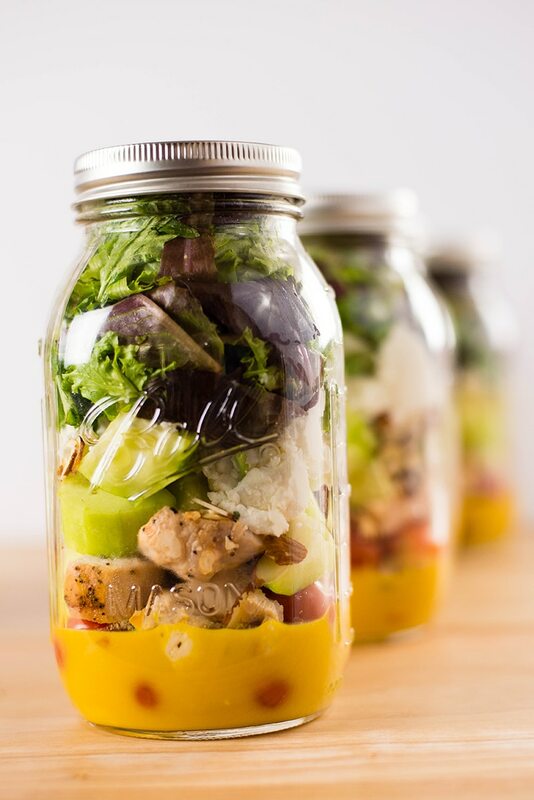 This mason jar salad is perfect for grab-and-go lunches and it is absolutely delicious. 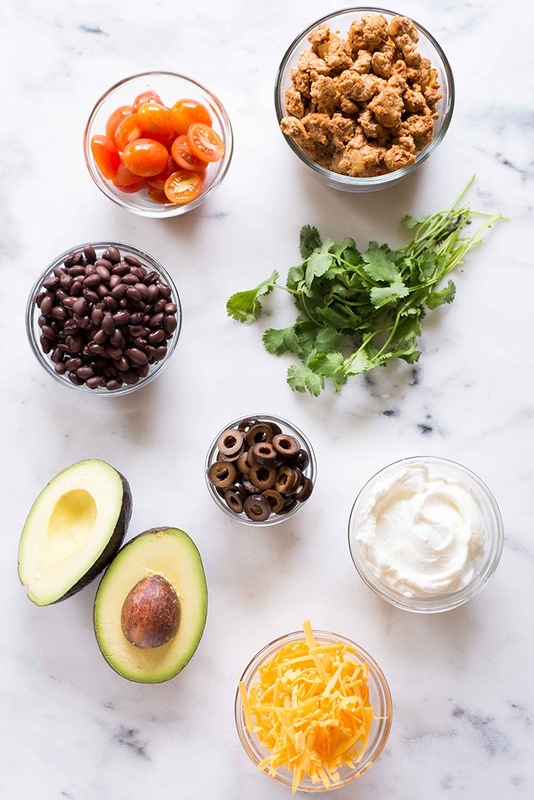 The 3rd salad on the list of easy packed lunches – Healthy Taco Salad Recipe. This salad is a great way to cut down on carbs but still enjoy the amazing flavors of tacos. Make this and eat it for lunch on Taco Tuesdays. 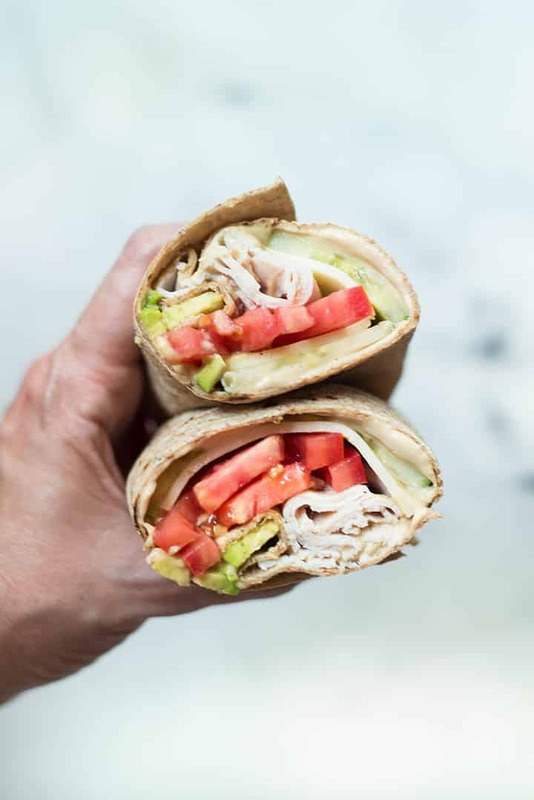 Let’s take a quick break from the salad packed lunch ideas to discuss these Avocado, Turkey & Hummus Wrap. They are full of goodness and ready in just 5 minutes. WOOT! Back to salads for another quick lunch idea – Beet & Goat Cheese Salad with White Wine Vinegar Dressing. This salad is packed with fiber, protein, and vitamins but also flavorful and delicious. Have you ever bought spring rolls for your lunch break? Yeah, there’s no need to do that anymore! 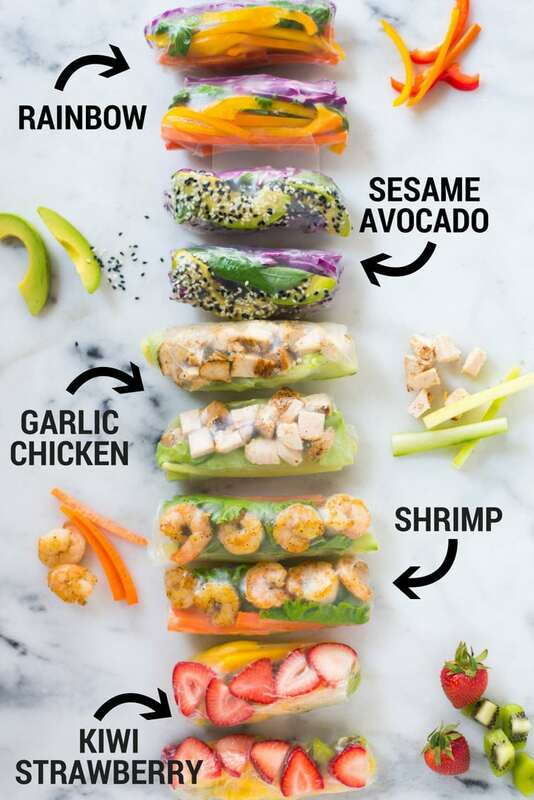 These 5 Healthy Spring Roll Recipes are great easy lunch ideas you can prep at home and take with you at work. You can prep them all at once or choose your favorite flavors and make those. It’s entirely up to you but all of them are totes amazing. This Quinoa Lentil Salad with Lemon Vinaigrette recipe belongs on your list of quick lunch recipes. 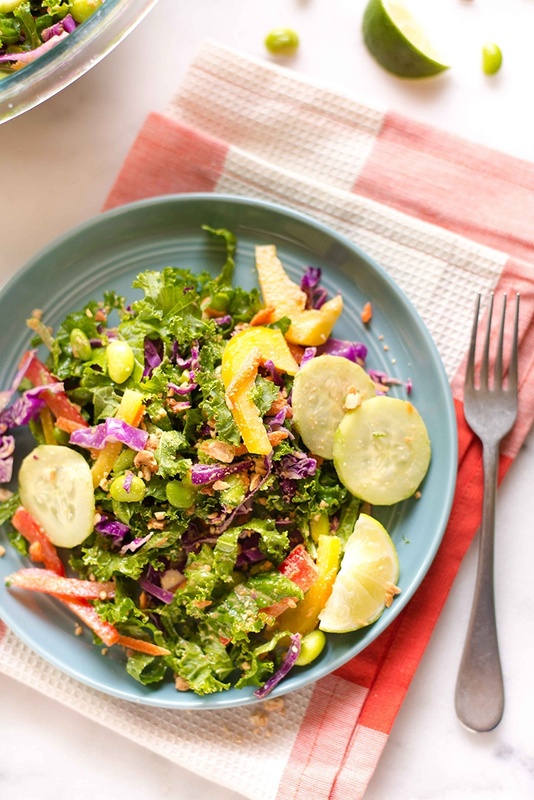 The salad is ready in 30 minutes and it’s light, healthy, and has bold flavors. 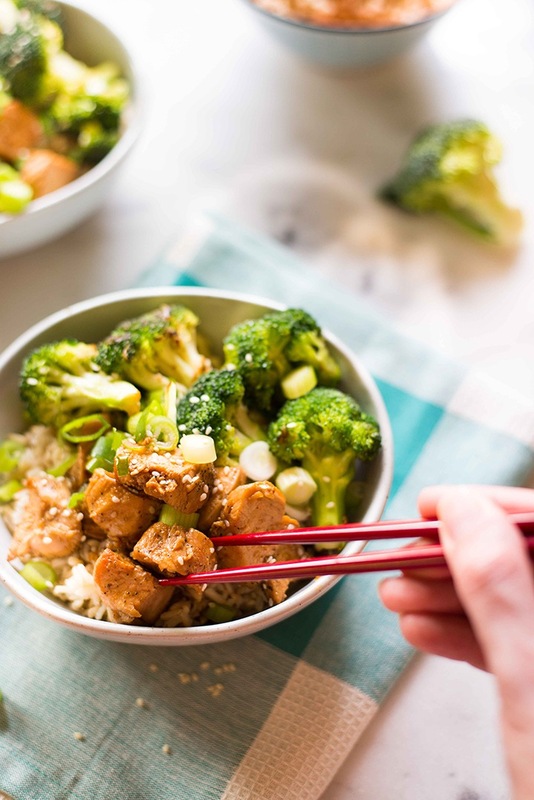 If you need filling, healthy lunches for work and salads simply don’t cut it, make this Chicken Teriyaki Rice Bowl. It’s definitely filling and satisfying. Not to mention delicious and easy to make. Do you love Thai cuisine and you visit the Thai restaurant close to your workplace during your lunch break? How about including this Chopped Thai Salad with Peanut Dressing on your list of homemade lunch ideas instead? 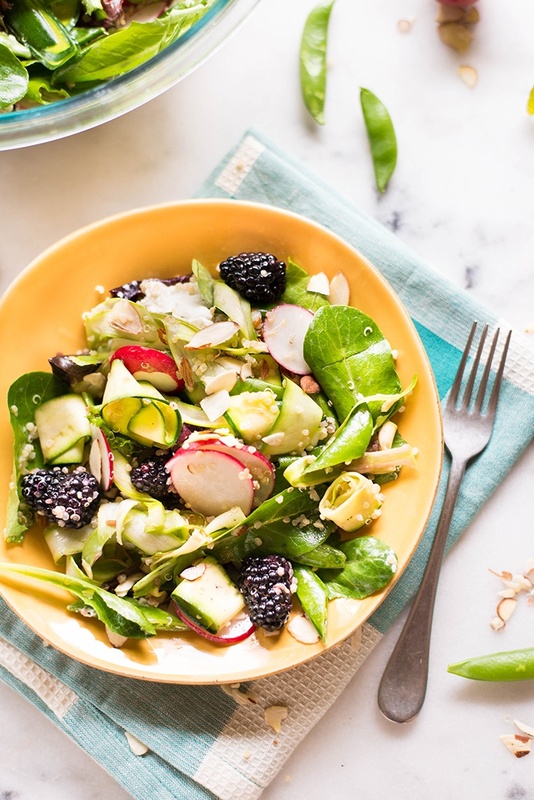 This salad has everything – awesome flavors, amazing texture, great taste, and it’s filled with healthy goodness. 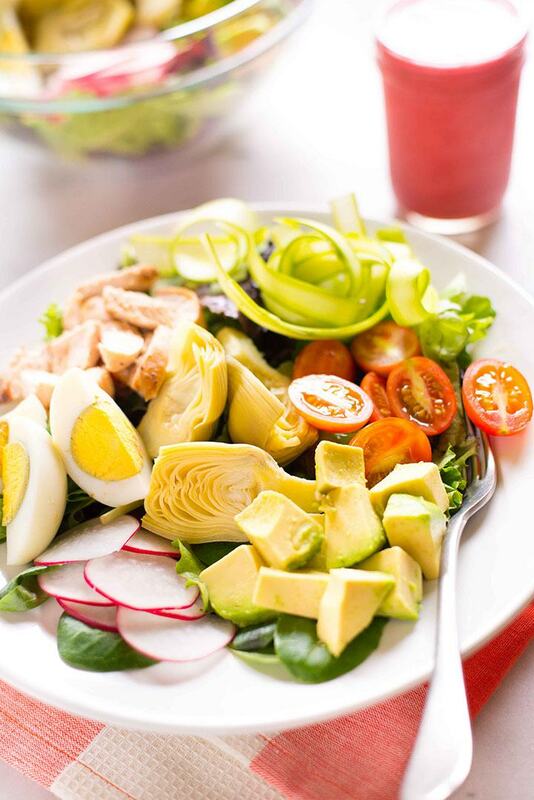 Bring spring flavors to your lunches to bring to work with this Springtime Cobb Salad with Raspberry Vinaigrette. 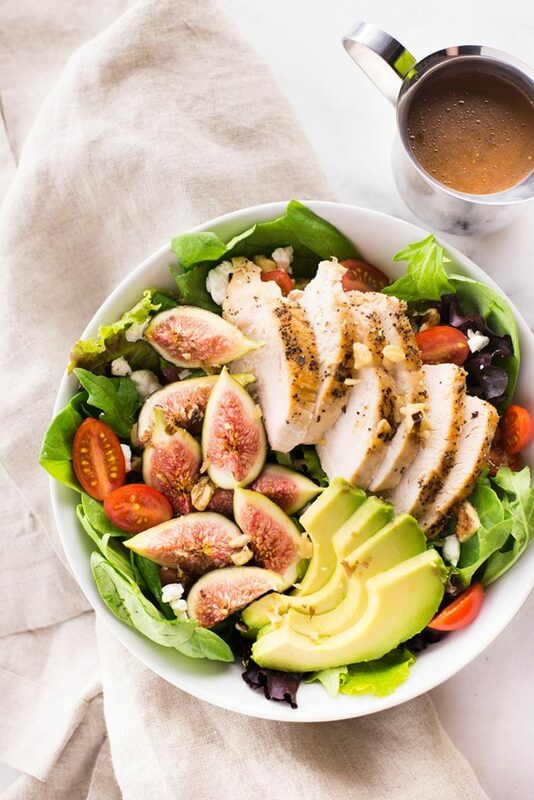 You’ve got chicken, asparagus, greens, avocado, radishes, and a delicious raspberry vinaigrette that enhances the flavors of all the salad ingredients. 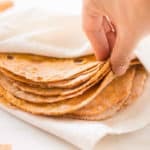 Another taco-inspired easy lunch for work? Yes! 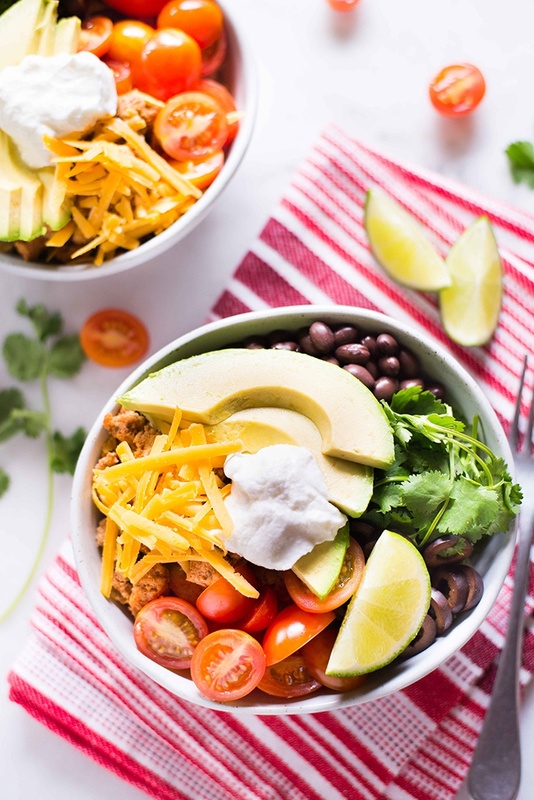 Except… this time we don’t have a taco salad, we have a Turkey Taco Lunch Bowl. This lunch bowl is nutritious, delicious, and easy to put together. Basically, everything you want from your quick lunch ideas. You know what your easy lunch recipes should include? Seasonal fruits! If it’s spring that means strawberries. 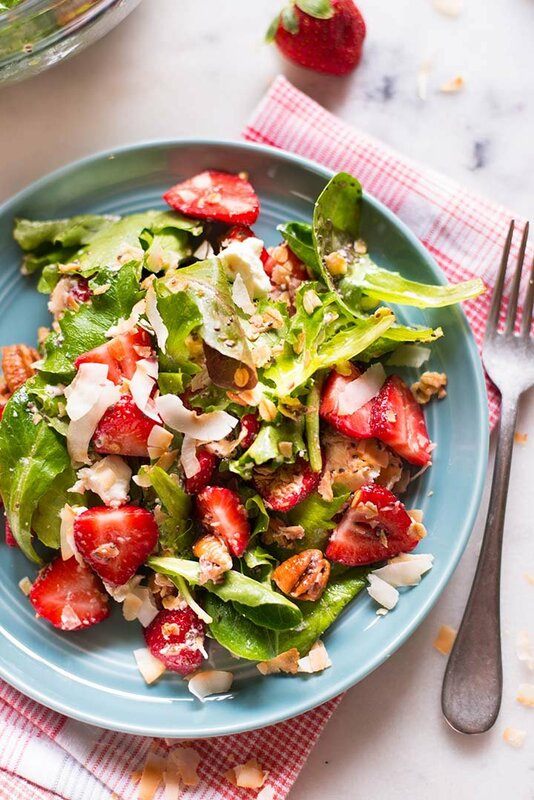 You can eat them as snacks or you can make this Strawberry Fields Salad with Chia Seed Vinaigrette. If I were you, I’d choose the salad. It’s so incredibly tasty and filling! I shared a wraps recipe and I think it’s time for another one. This time we have Chicken & Hummus Greek Wrap. 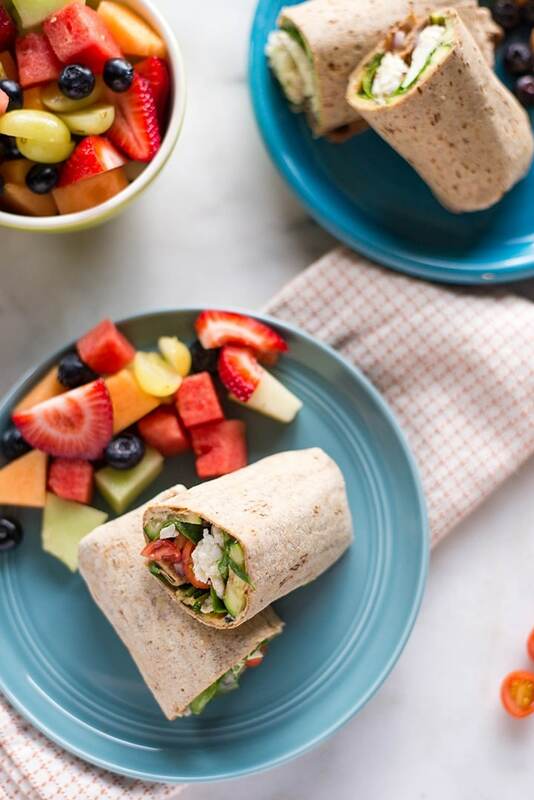 Wraps are delicious but simple lunch ideas you can prep in a few minutes and you can fill them with your favorite healthy ingredients. Pretty much lunch perfection, don’t you think? 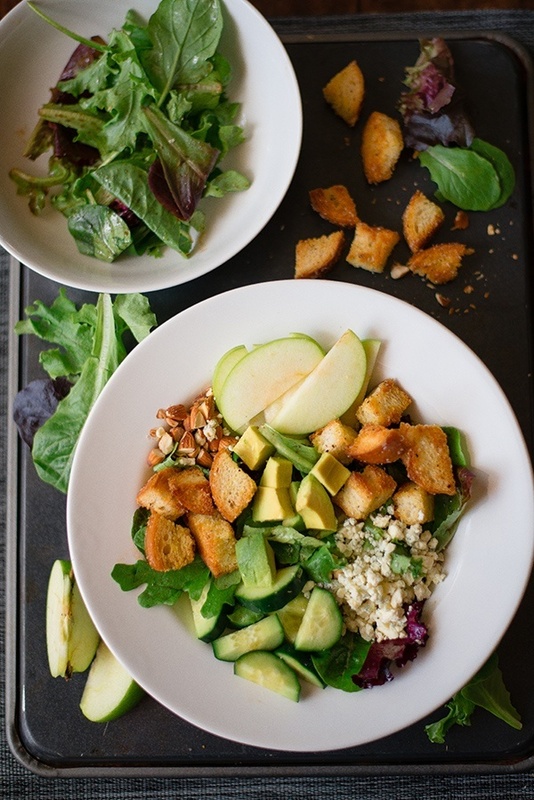 Have you ever tried this Spring Grains + Greens Salad with Honey Lemon Vinaigrette before? 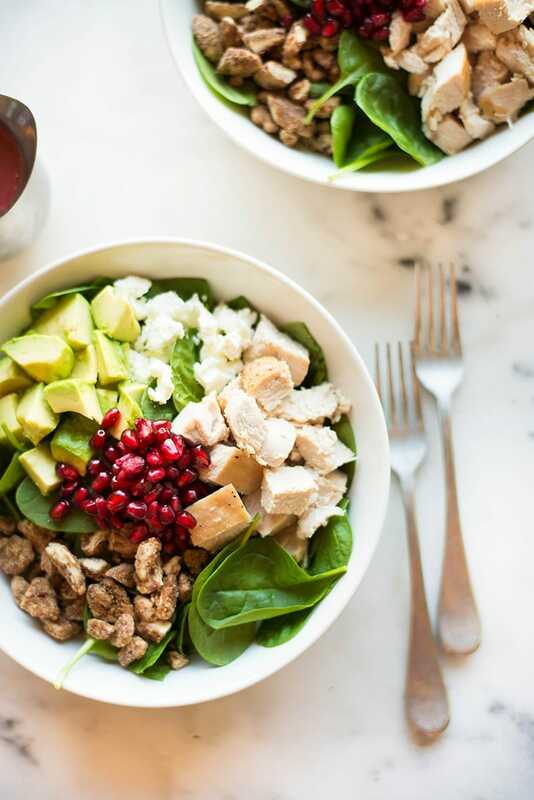 It’s one of my favorite healthy lunch ideas for work especially during spring and summer when I crave fresh and light lunches that are also filling and delicious. 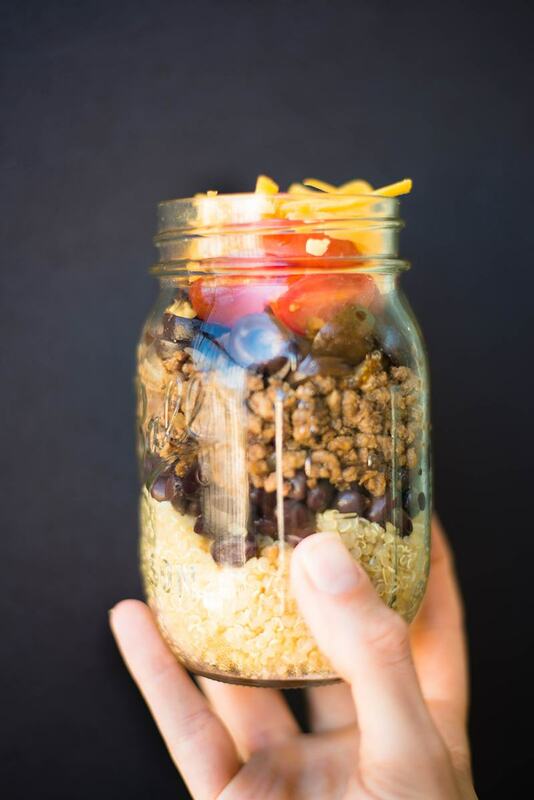 Mason jar salads and these Quinoa Taco Stackers are easy lunches to pack. Actually, you pack them while making them and then all you have to do is grab them from the fridge take them to work with you for a yummy and healthy lunch. Easy peasy! 16. SHEET PAN SAUSAGE AND VEGGIES – PERFECT FOR MEAL PREP! What else can you do and pack as healthy lunches for work? This Sheet Pan Sausage and Veggies – Perfect for Meal Prep! Sheet pan meals are always easy. And there are fewer dishes to clean. Don’t know how you feel about this but, for me, that’s a big plus. The best lunch ideas for work? 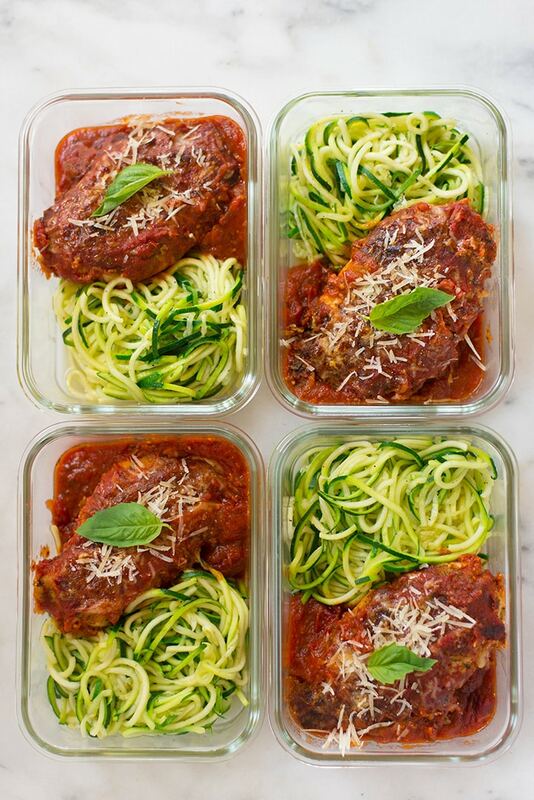 Your favorite dishes that can be easily placed in meal prep containers and reheated at work. And that includes enchiladas, tacos, and other yummy dishes. 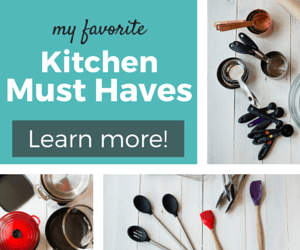 You know what you need for these dishes? 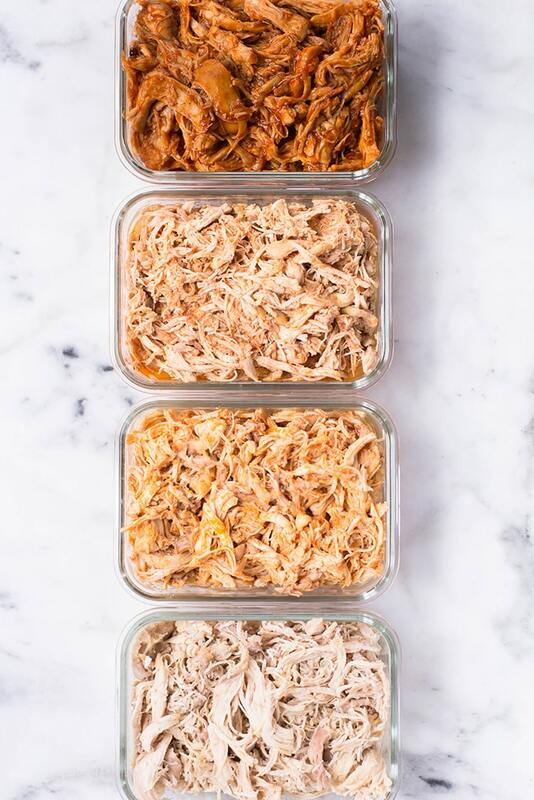 This Slow Cooker Shredded Chicken Meal Prep! You have 4 different flavors and all of them are so incredibly tasty. 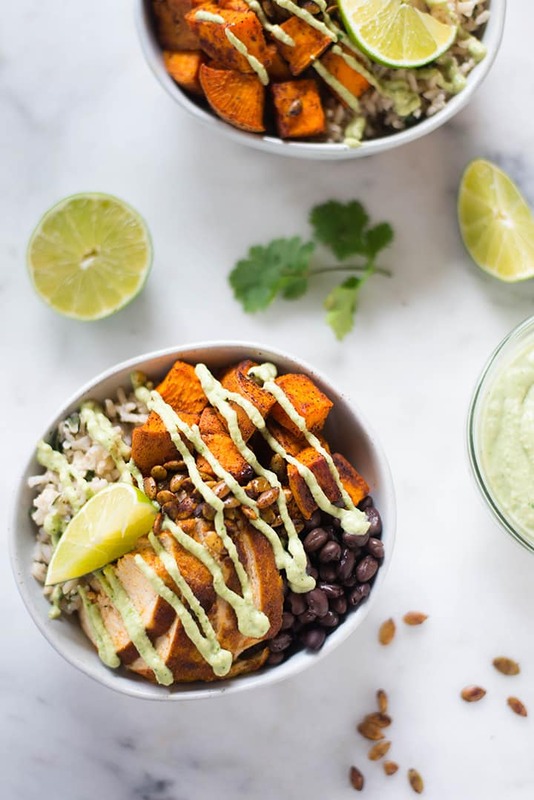 Made with spicy chicken, black beans, savory sweet potatoes, toasted pumpkin seeds, and drizzled with a cashew lime crema, this Chicken Protein Bowl with Cashew Lime Crema is a lunch option you will definitely fall in love with. 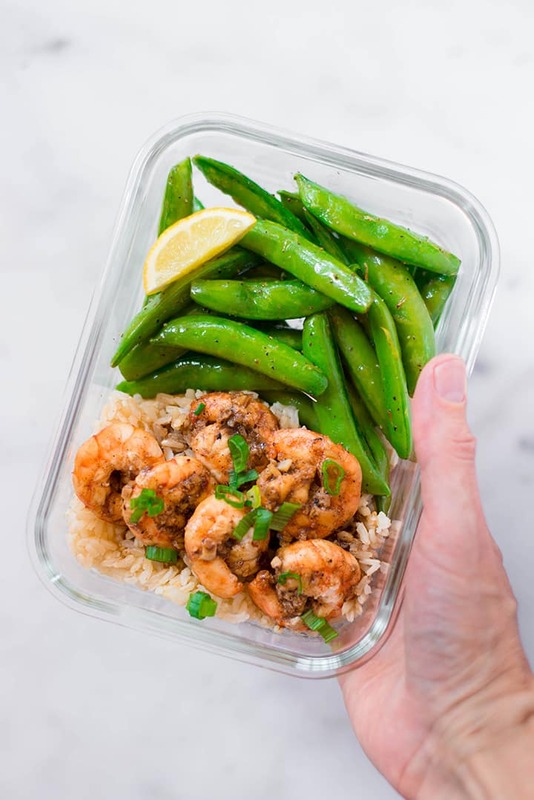 Great for weeknight dinners but also great as quick lunch recipes, the Honey Garlic Shrimp Meal Prep with Instant Pot Brown Rice and Lemon Snap Peas is a perfectly balanced meal that has amazing flavors. Learn How To Meal Prep | Honey Garlic Shrimp Meal Prep (Under 350 Calories!) and you have other lunch ideas for work that will make your colleagues jealous of your lunches. 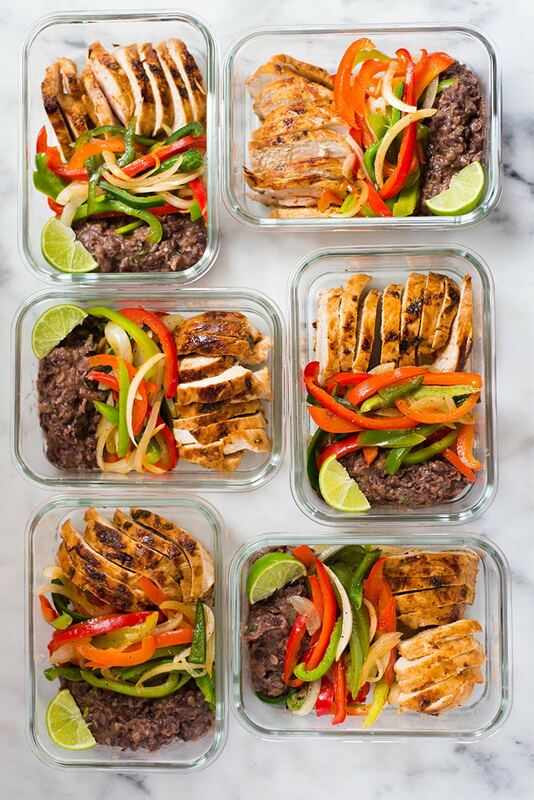 These Healthy Chicken Fajitas also make great lunches to bring to work. And they are healthy. And budget-friendly. And don’t get me started on the amazing taste and the delicious flavors. When I said that meal prep will help you stay on top of your easy lunches for work game, I hope you believed me. But, if you didn’t, I have another post that will teach you How to Meal Prep – Healthy Chicken Parmesan (Under 350 Calories!). Sound good? 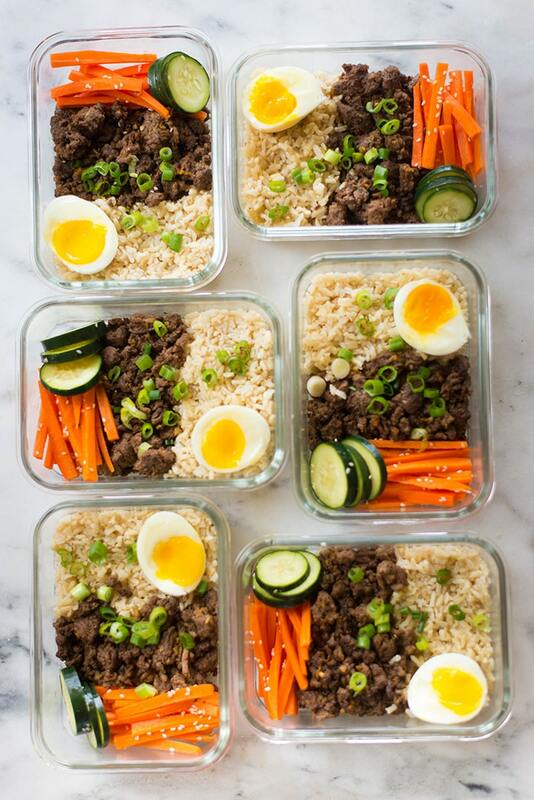 Learn How To Meal Prep – Korean Beef Bowl (6 Meals/Under $4), cook once and never worry about work lunch ideas for a week. See? Meal prep is truly awesome. And the taste of this Korean Beef Bowl is so so so good. 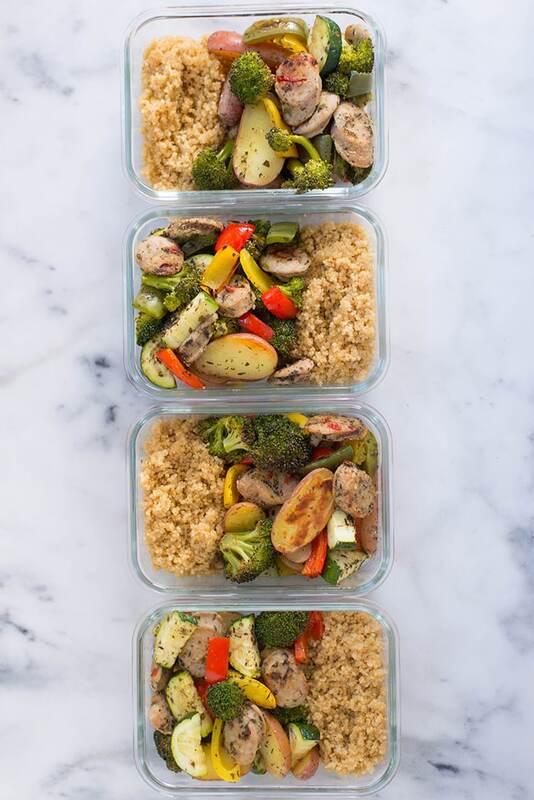 Another meal prep recipe? Why not! This one is quick and easy so you’re gonna love it! 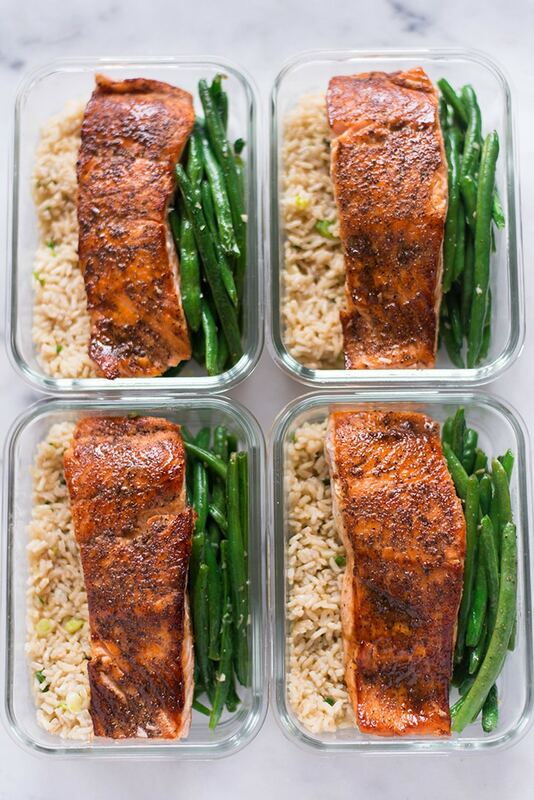 Learn How to Meal Prep – Salmon and you can add another amazing recipe on your work lunch ideas list. 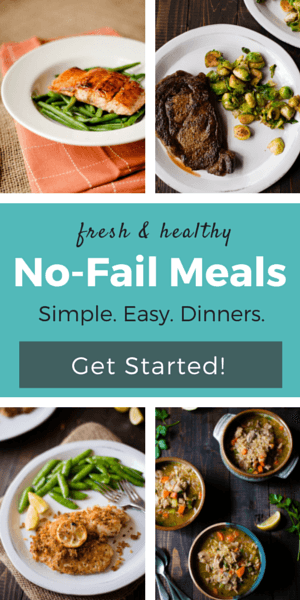 This meal prep works for weeknight dinners too BTW. Two more meal prep recipe and then we’re going to take a break from meal prep and explore other easy lunches for work options. You’re gonna love these ones though! 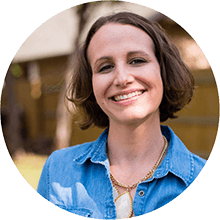 The first one involves budget-friendly chicken meals and tips for How to Meal Prep – Chicken. 25. MASON JAR SALAD FOR MEAL PREP + A KILLER CLEAN HONEY MUSTARD DRESSING! The second one involves another mason jar salad. 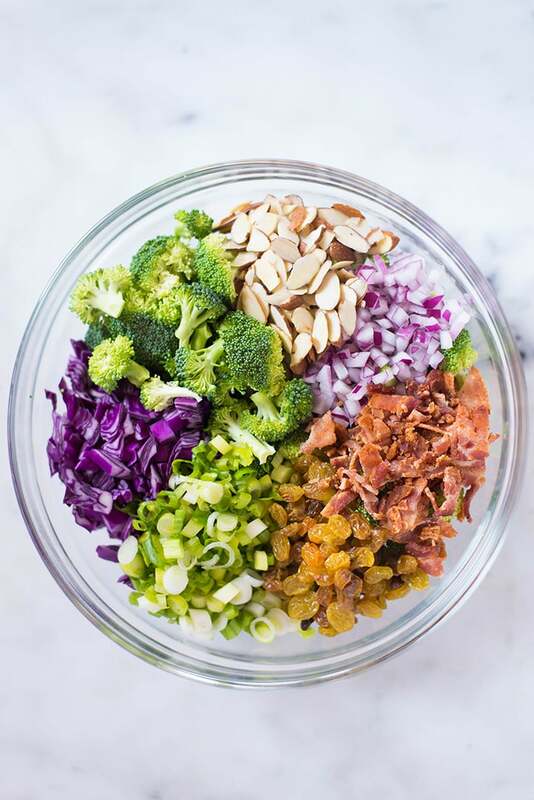 A Mason Jar Salad for Meal Prep + A Killer Clean Honey Mustard Dressing! 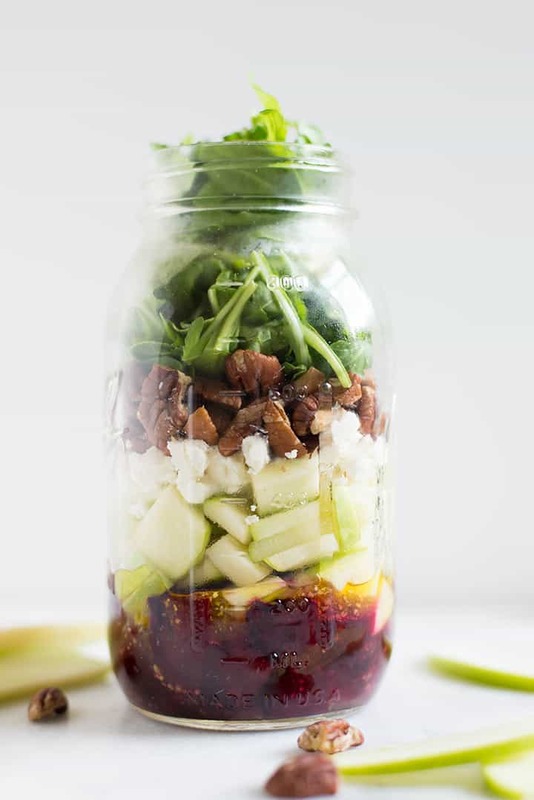 Seriously though, I feel like mason jar salads are the best work lunch ideas. Remember when I told you using seasonal fruits is a great idea for easy lunches to take to work? Well, I can say the same thing about veggies. 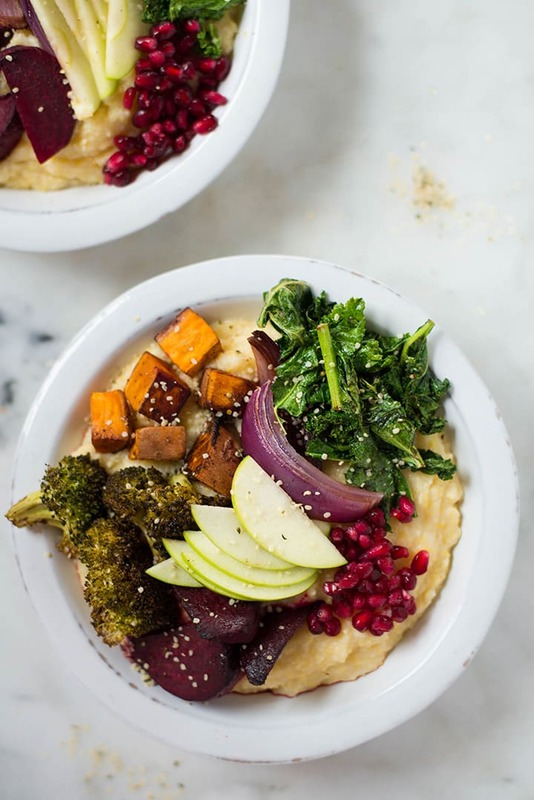 Particularly about Fall veggies because this Fall Harvest Buddha Bowl on Cauliflower Grits is all about amazing Fall flavors. Pssst, you can prep it year round tho’. 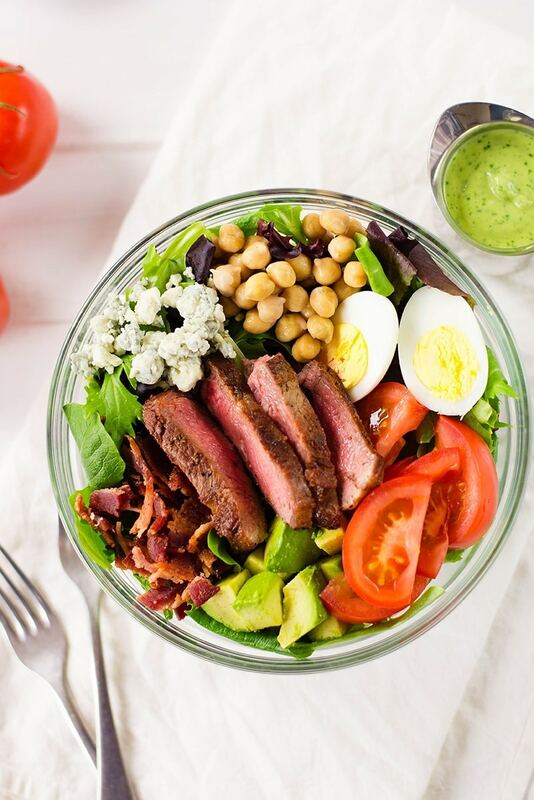 Fresh and easy to make the recipe for this Steak Cobb Salad With Creamy Avocado Cilantro Lime Dressing makes 2 salad servings. Which means 2 healthy lunches for work. 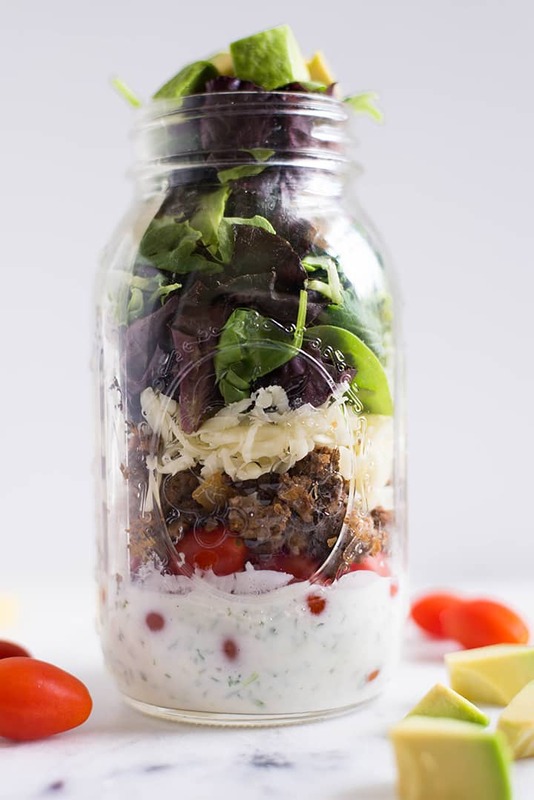 Double or triple the recipe and store the salad in mason jars if you want more days of yumminess. I’m sure you’ve had chicken strips for lunch before. Who didn’t? They are convenient and, let’s be honest, tasty. Are they the healthiest lunch option? Definitely not. 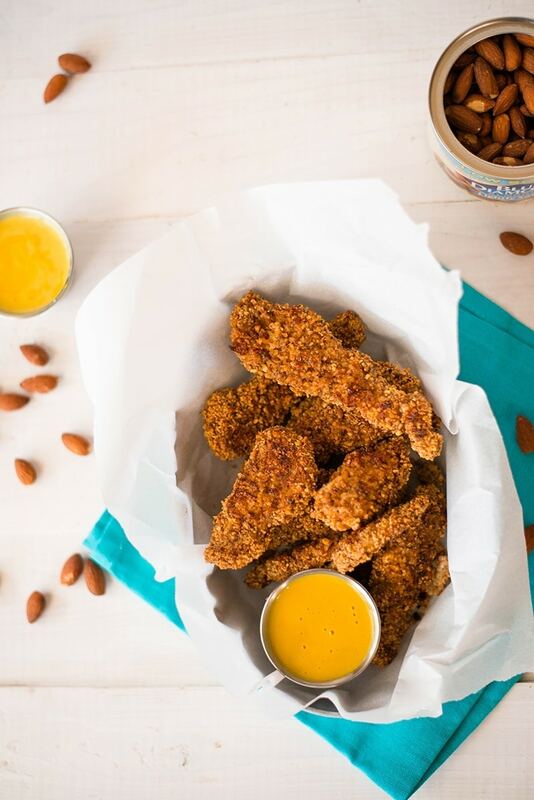 Unless… well, unless you make these Baked Almond Chicken Strips! They are clean and healthy and even more delicious than traditional chicken strips. 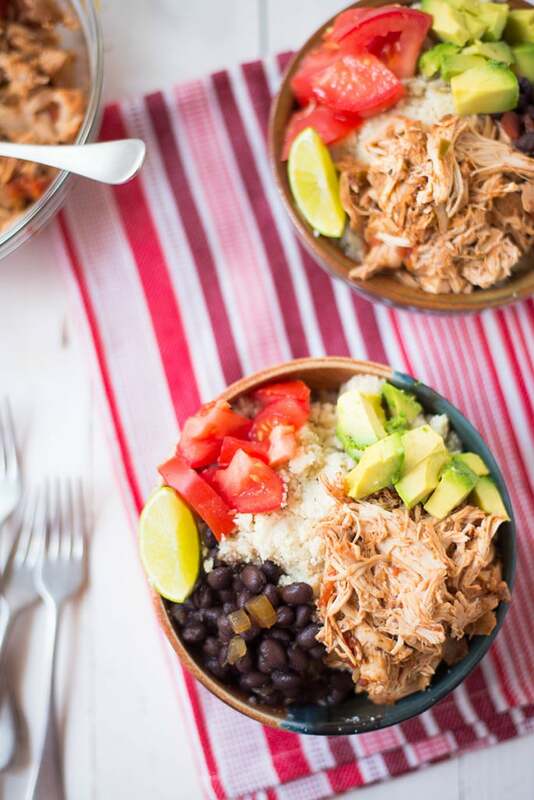 These Slow Cooker Chicken Burrito Bowls are amazing healthy lunches for work. 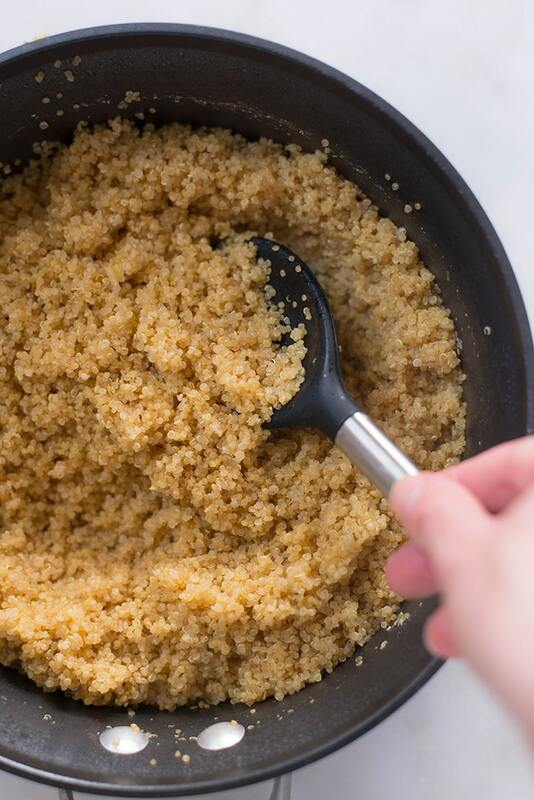 They will keep you full for hours, they are healthy, they are low-carb thanks to cauliflower rice. They are simply amazing! Whenever you have turkey leftovers, turn them into easy lunch recipes. Recipes like this Leftover Turkey Salad With Cranberry Vinaigrette. Fajita again? I know, yum, right? 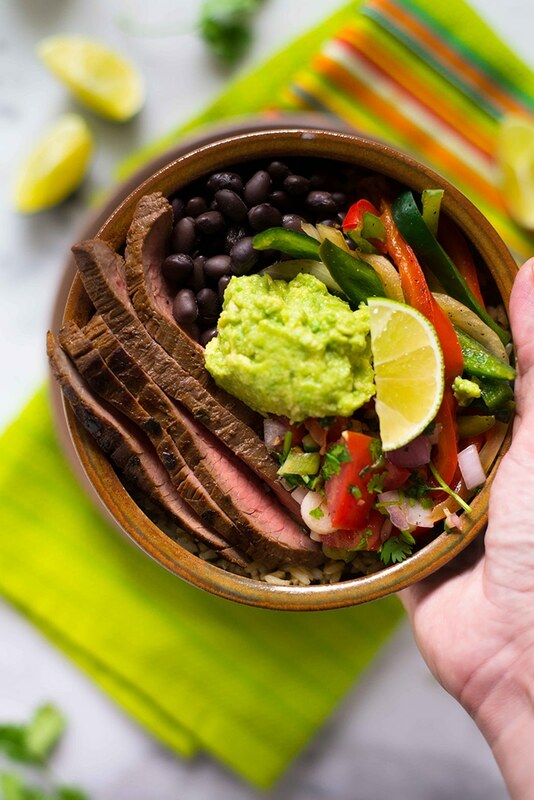 We had chicken fajitas earlier and now we have Steak Fajita Bowl with Cilantro Lime Rice. 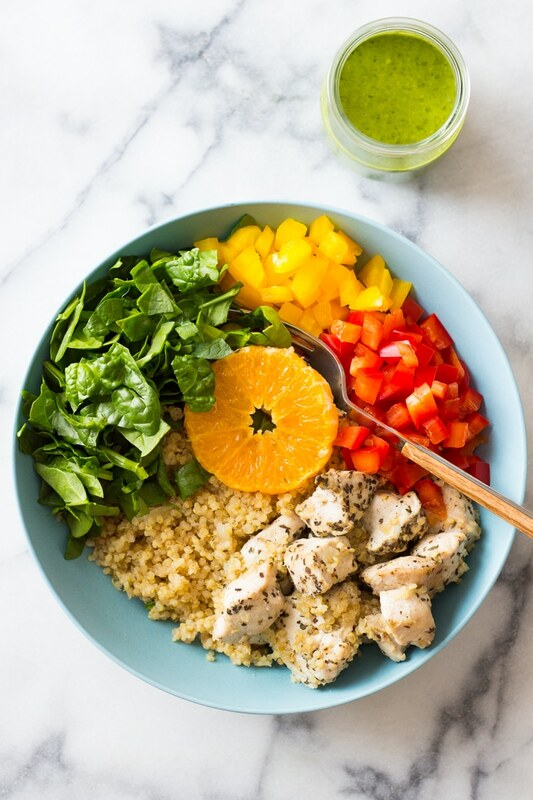 Another perfect lunch bowl filled with goodness. How do you like my lunch bowls so far? Don’t you think they are easy lunches for work? 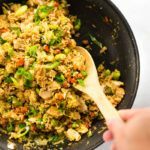 Glad you agree cuz’ I have another one – Instant Pot Quinoa Chicken Bowl. You know what’s been missing from this easy lunches for work list? 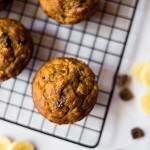 A sweet potato recipe! Because sweet potatoes are amazing all day long – breakfast, lunch or dinner, sweet potato can save the day. 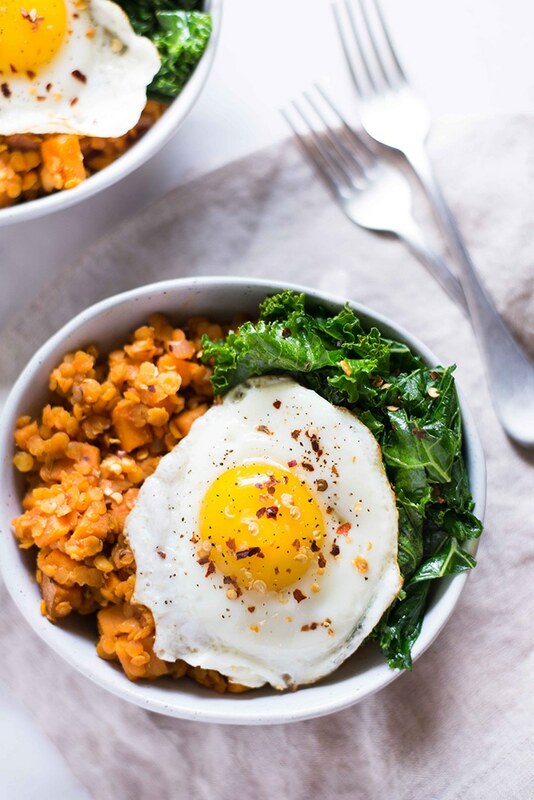 I like this Sweet Potato And Lentil Hash with Garlic Sauteed Kale for lunch – it’s rich in fiber, protein, and flavor. Missing the wraps for easy packed lunches? No need to! 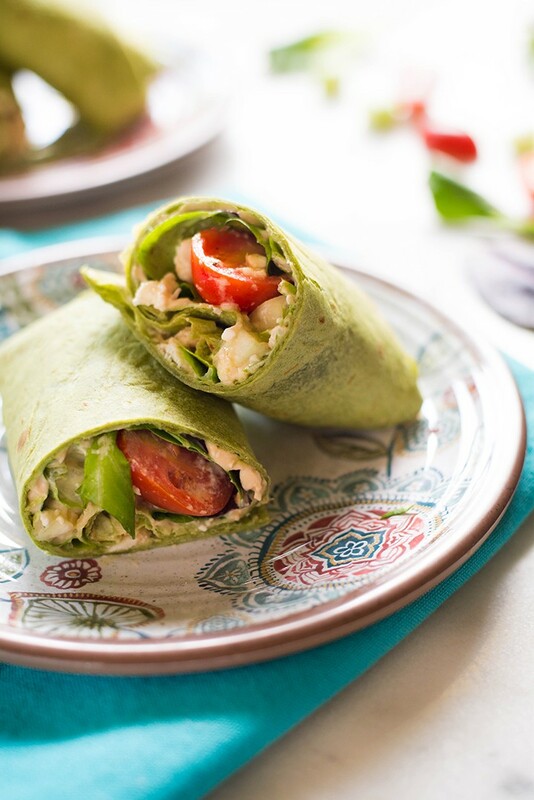 Here’s another Spinach, Egg White & Zucchini Lunch Wraps recipe I think you’ll like a lot. My favorite end of summer ingredient? Figs! They bring back so many happy memories. And they are delicious so I like to add them to this End Of Summer Salad With Fig Balsamic Vinaigrette. More lunch bowls? Sure thing! 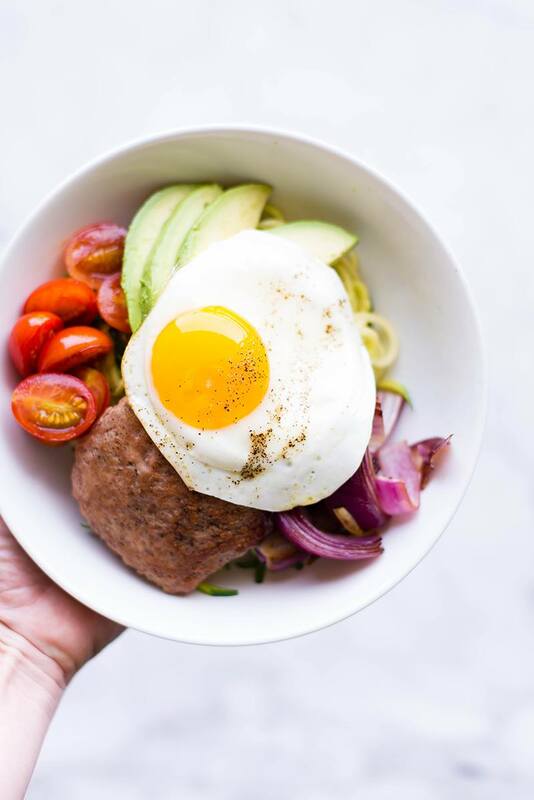 What about this Low Carb Turkey Burger Bowl with Sriracha Mayo? It’s like a burger… except healthier. And low-carb. Amazeballs! 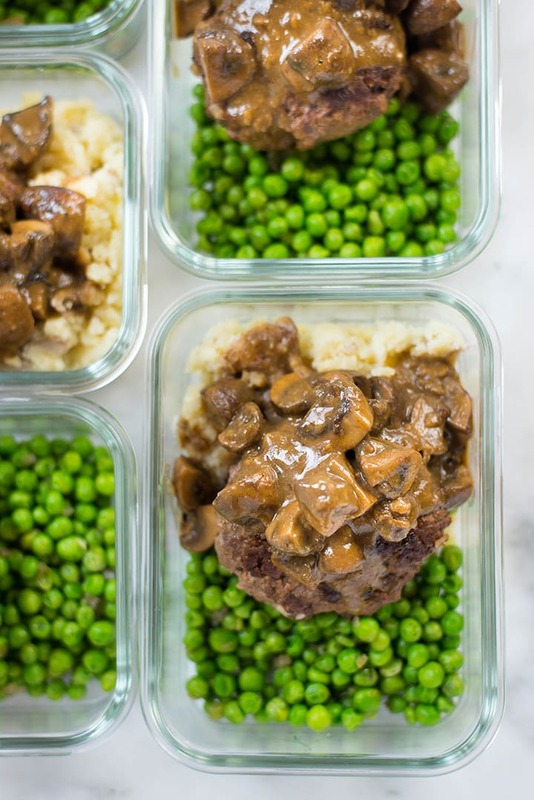 How To Meal Prep: Salisbury Steak Recipe this is such a delicious meal. Whether you choose it for your healthy lunches for work or for weeknight dinners, you have to try it because it’s amazing. It’s healthy Salisbury steak, after all. Beet and feta is a combination that I adore. Especially in easy lunch recipes. There’s something magical about this lunch combo. 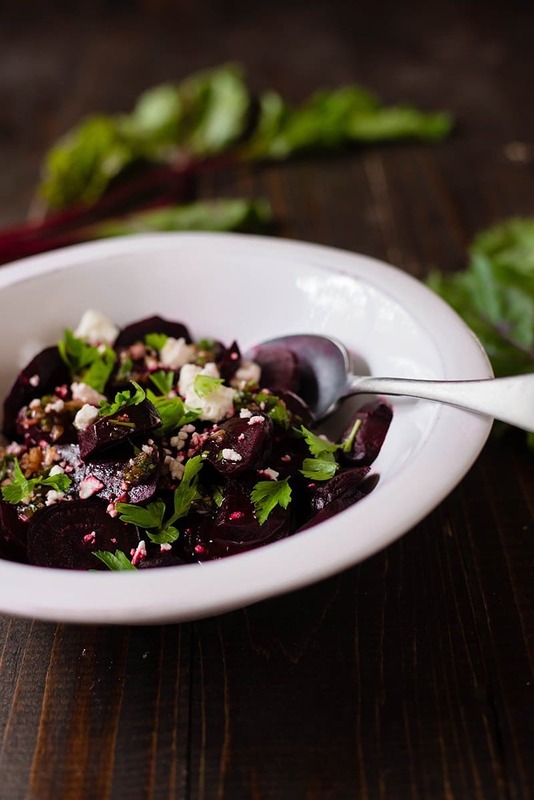 Try this Roasted Beet Salad With Feta and let me know if you agree. Brace yourselves! It’s pizza time! 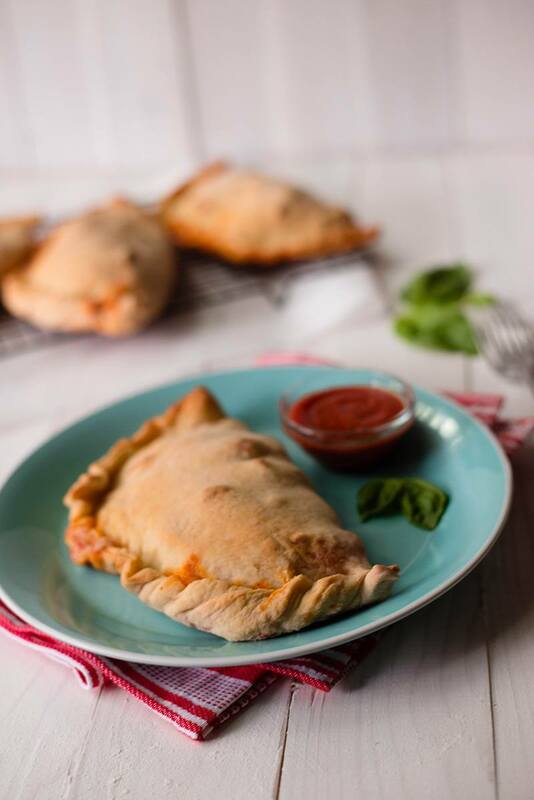 Learn How To Make A Calzone and transform your lunch into a delicious and flavorful experience. 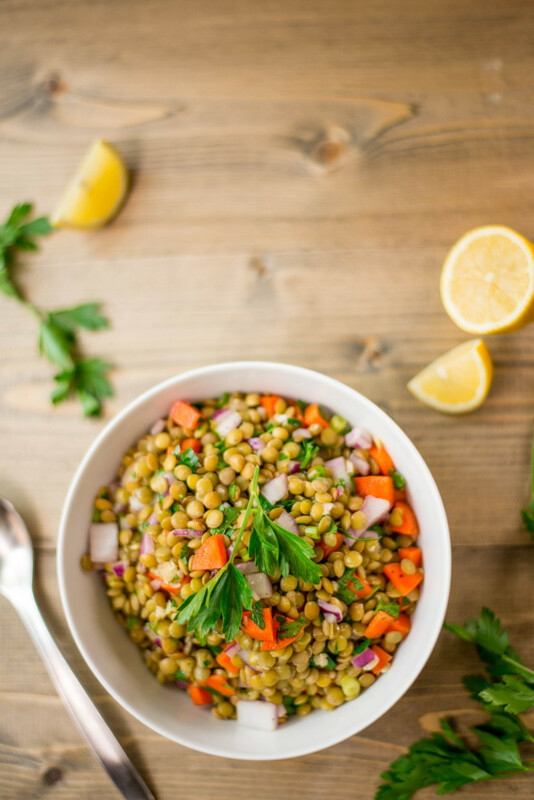 Nutritious and delicious, lentils are great in easy lunch recipes. They are good warm but I also like them cold. 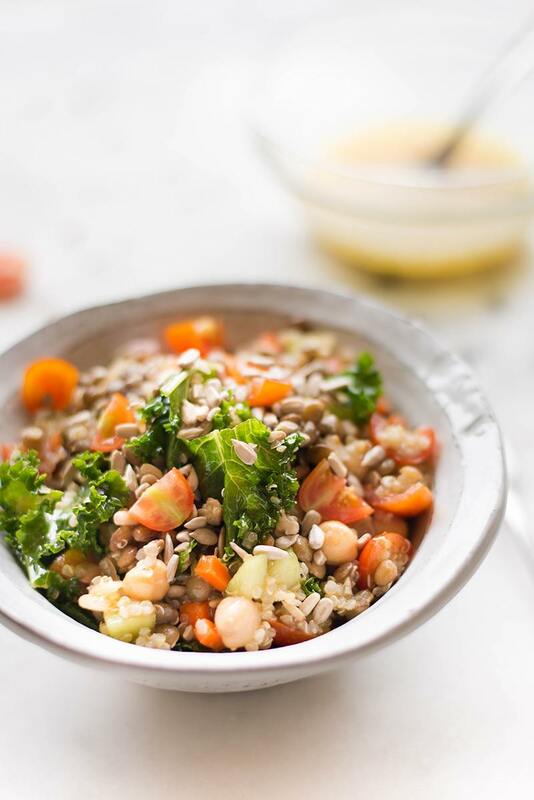 Like in this vegan and simple Cold Lentil Salad. When I said that homemade lunch ideas don’t have to involve boring sandwiches and not filling enough salads, I meant it. Can you believe we talked about 40 recipes and not even one of them was a recipe for lunch sandwiches? But it’s time! It’s time to have sandwiches on this list of easy lunches for work. 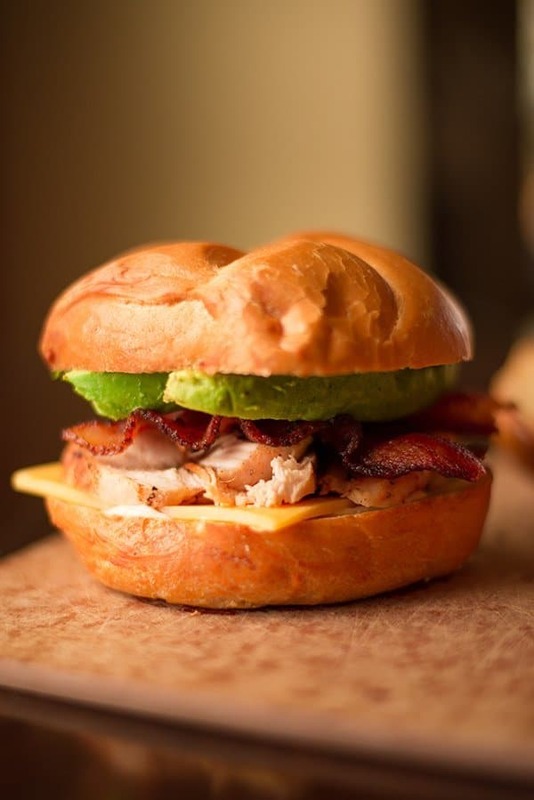 However, these Bacon & Chicken Sandwiches are anything but boring. They are super yummy actually. I recommend keeping these for cheat days tho’ since they are not the most low-calorie option on this list. Remember I told you I love beet and feta combined in a lunch salad? Well, there’s another combo I really, really love – Apple and Gorgonzola Salad with Balsamic Vinaigrette. So yummy! 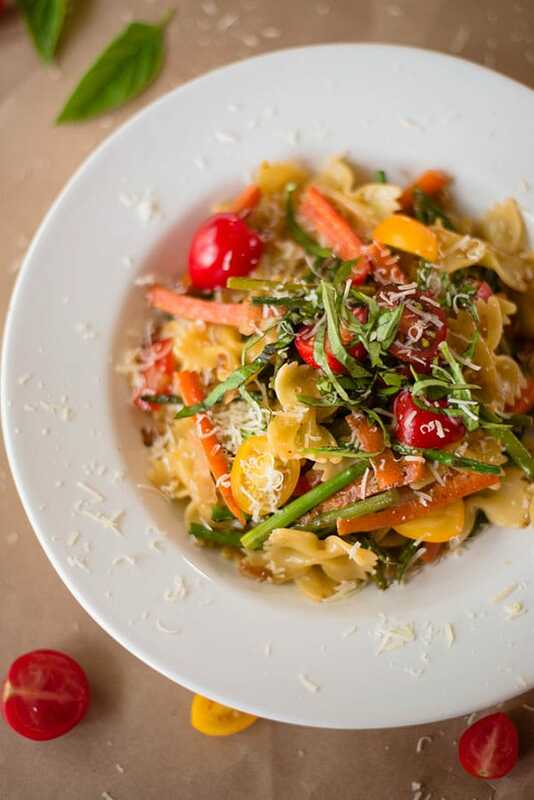 Time for easy lunches for work classics – Pasta Primavera. Simple lunch ideas are the best lunch ideas! The more veggies you incorporate into your diet, the better. And doing this doesn’t have to be complicated. 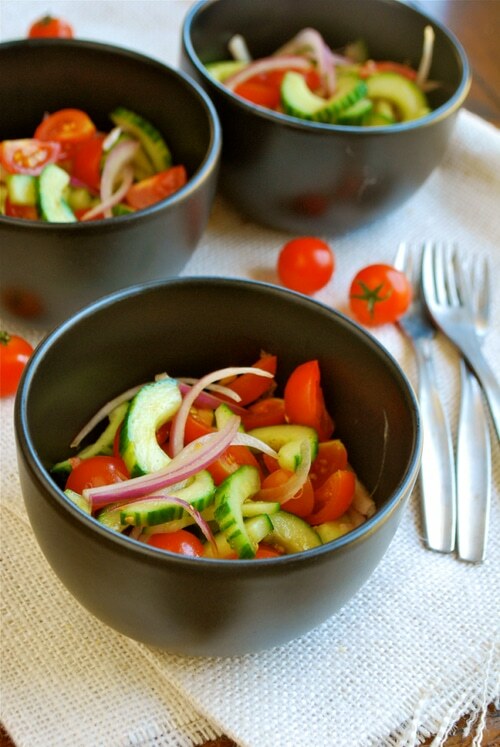 It can be as simple and easy as adding this Cherry Tomato and Cucumber Salad as a side salad to your lunch box. 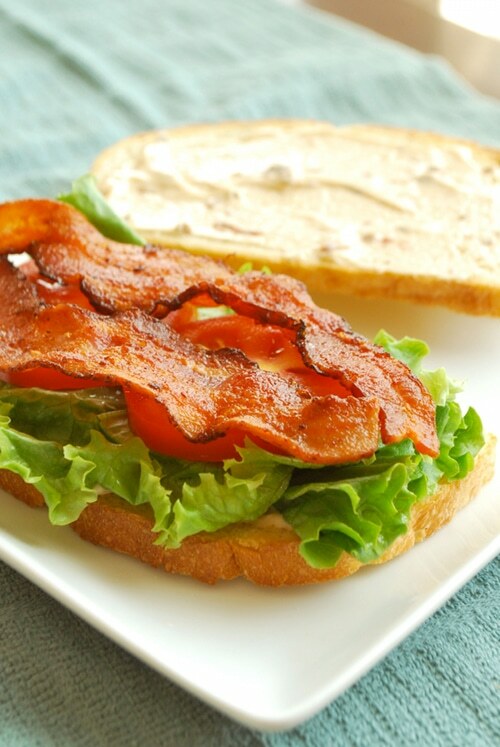 After the Bacon And Chicken Sandwich, it is time for another delicious sandwich recipe – BLT with Chipotle Mayo. A classic. But a delicious one. With easy packed lunches like these sandwiches, you’ll be very excited for lunch break. Gotta love the classics, right? Well, I’d say paninis are other classic lunch ideas for work. Also easy to make. And you can make them in so many different ways. 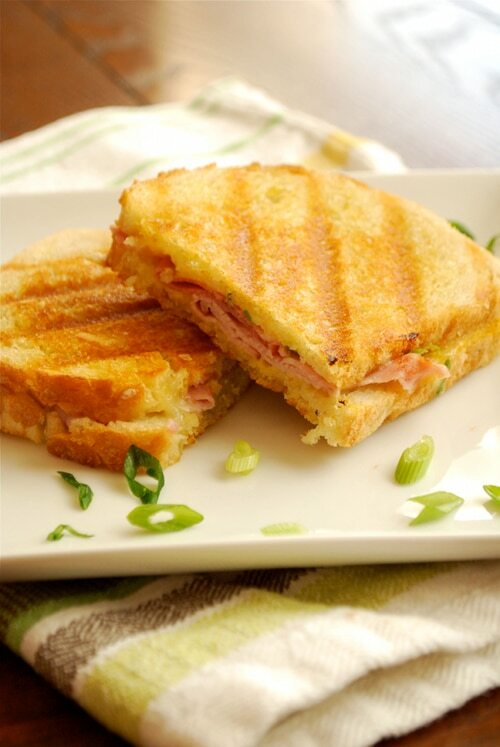 My recommendation is this Ham and Gruyere Panini. Super yummy! 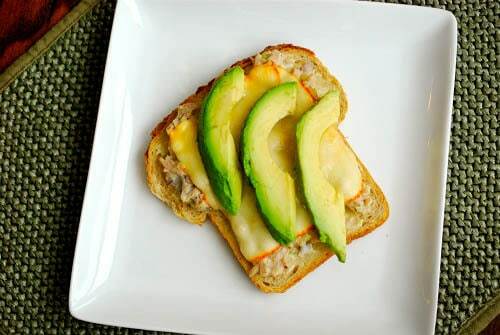 Made from scratch with fresh tuna, this Tuna Melt is so much better than the tuna melt made with canned tuna. And it’s super easy to make them. They are, of course, easy lunches to pack as well. If your ideal lunch ideas for work consist of sandwiches and you are loving the recommendations I gave you so far, I have good news – 1. 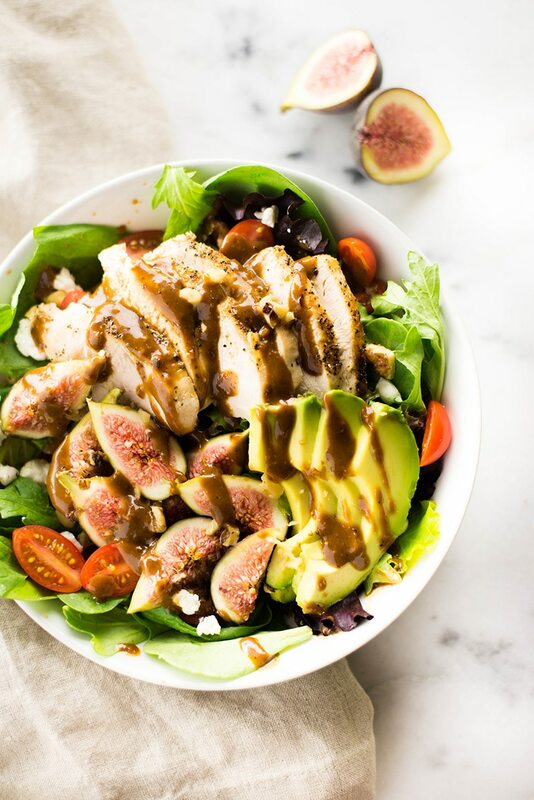 I have another yummy classic recipe you’ll love right after this one and 2. you should make this Balsamic Vinaigrette Salad and enjoy it as a side salad for your sandwiches. It will simply make your lunch better! 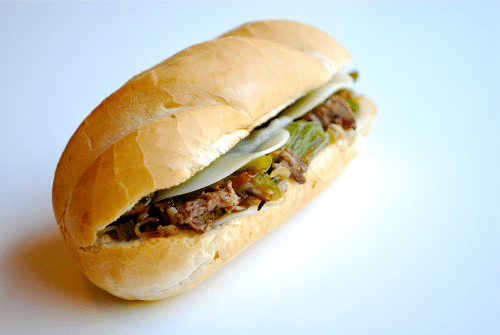 And the classic I just mentioned, the cheesy and awesome classic – Philly Cheesesteaks. You can never go wrong with such a classic. It’s impossible. Ending this list of easy lunches for work like we started – with a delicious and filling salad. 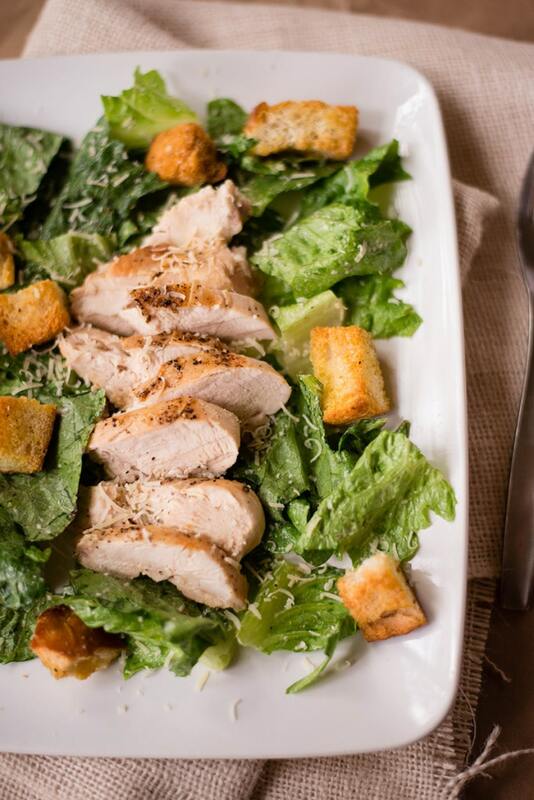 A Chicken Caesar Salad! You know it and you probably love it. I do too. And I like to make it at home. So can you. Did I miss anything? Share below on what recipes you love to take to work with you or ones you’d love to see a healthy version of! Happy lunching! !